This delicious dish is easily put together and really tasty. It originated in Kolkatta (Calcutta) and is often called the Calcutta Kati Roll. 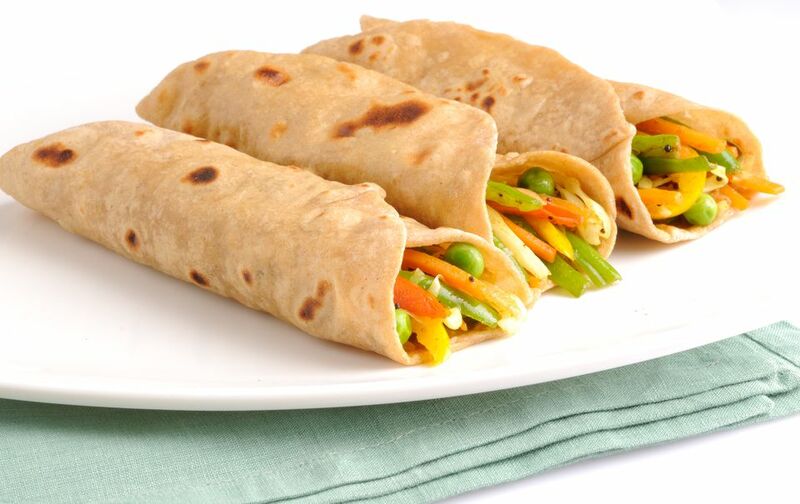 Juicy morsels of spicy chicken are wrapped in paratha (pan-fried flatbread) that has been coated with egg. To ensure smooth workflow, it is best to make the parathas and chutney required for the rolls before you prepare the chicken. That way, when the chicken is ready, all you need to do is assemble. Heat 3 tablespoons oil in a deep pan over medium heat. When hot, add the cumin seeds and fry for 1 minute. Add the sliced onions and fry till soft. Add garlic and ginger pastes and fry for 1 minute. Now add all powdered spices (including garam masala) and fry until oil begins to separate from the masala (spice-onion mix). Add the chicken pieces and brown, about 6 to 8 minutes. Add the tomato and salt to taste. Stir well and add 1/2 cup of water. Cook until chicken is tender, about 12 minutes. There should be almost no gravy at this stage. Heat a frying pan over low heat and add 1 tablespoon of oil to it. While the oil is heating, break 1 egg into a bowl. Season with salt to taste and whisk the egg till fluffy. Pour into the pan and spread by tilting the pan from side to side. Now quickly put a paratha onto the still wet egg and allow to cook. The egg will soon cook and set. Flip the egg-paratha over. Cook for 30 seconds and remove from the pan. Repeat this process with remaining oil, eggs and parathas. To assemble the rolls: Lay one egg-paratha on a plate and spread Mint-Coriander Chutney on it (how much is a matter of personal choice). Add roughly 2 tablespoons of the cooked chicken in a line down the center of the paratha. Roll tightly. You can wrap in foil at this stage, to help keep it together and tidy for eating--the filling can fall out otherwise. Serve hot.